Everything is just more fun to eat when it’s bite-sized. Don’t you think? Two little bites. That’s all it takes to enjoy these phenomenal Chinese Chicken Salad Mini Tacos. Occasionally I’ve seen pre-made mini taco shells on shelves at the grocery store. If however, your store does not carry them, don’t worry! They are a piece of cake to make! 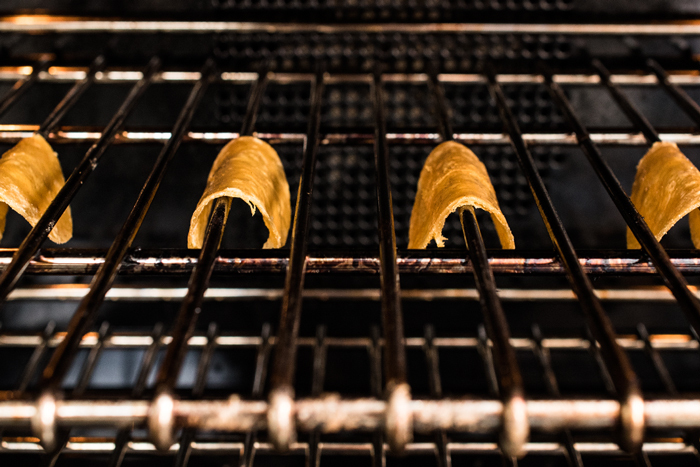 All you need is 3 things – a pack of corn tortillas, a 3-inch cookie cutter, and cooking spray. Oh, and they’re baked. Not fried. Double points! The Chinese chicken salad is actually a bit of a misnomer. It’s not at all Chinese, more like Chinese-inspired. The exact origins are debated, though sources mention evidence of it first showing up in the 1930’s. Other sources attribute Wolfgang Puck as its creator, as well as Cecilla Chiang – chef and owner of the Mandarin Restaurant in San Francisco. In addition to the salads ambiguous origins, there are probably as many variations of the recipe as there are American households. Generally a Chinese chicken salad is made with romaine lettuce, cabbage, carrots, chicken breast, fried wontons or rice sticks, and nuts such as almonds or peanuts. A slight difference, I chose to use napa cabbage. Likewise, I added radicchio (which lends a really lovely and subtle bitter taste) and really bumps up the variety of flavors. As for the crunch factor – the crispy tacos are not only a wonderful vehicle for the chicken salad, but they are also used en lieu of the rice sticks and nuts which are so frequently seen. 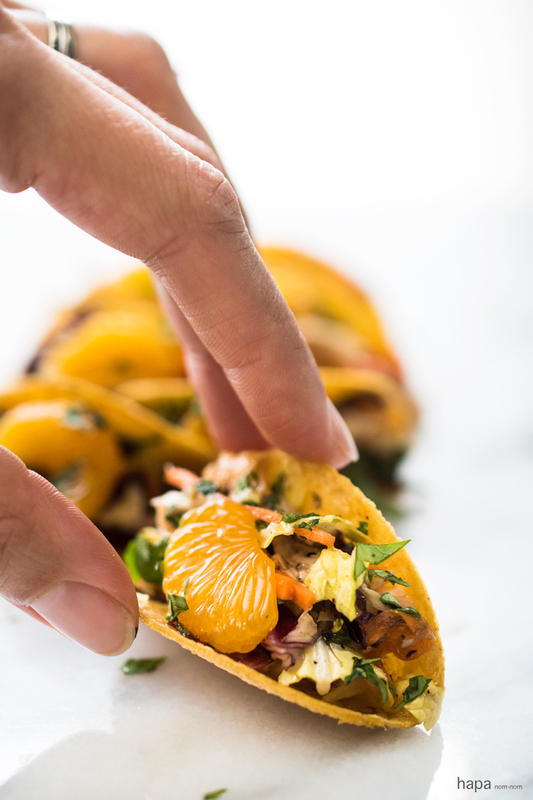 And let’s face it – as I said earlier, mini tacos are just so fun to eat! Whether you’re planning, a party, a small get-together, or just want to make them for your family, these are sure to be a hit! They were certainly popular amongst my husband and I – there wasn’t a single one left after they were photographed! Everything is just more fun to eat when it's bite-sized. Don't you think? Two little bites. 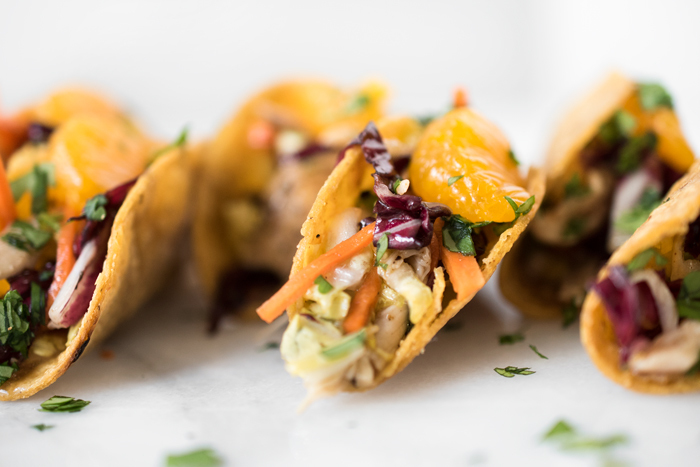 That's all it takes to enjoy these phenomenal Chinese Chicken Salad Mini Tacos. To make the dressing, add the red wine vinegar, grapessed oil, sugar, salt, and pepper to a small sauce pan. Over medium heat, stir the contents until the sugar has completely dissolved. Do not let it boil. Set aside and allow to cool. Stamp out the mini tacos using the 3-inch cookie cutter. (Don't throw the scraps away! You can fry them up in some oil or bake them to snack on later). Working in batches, (about 10 at a time) wrap the mini tacos in a damp paper towel and microwave for 15 - 20 seconds, so that they're pliable. Pull apart and carefully drape each mini taco over every couple of grates in the oven, as in the picture above. Cook for 5 -7 minutes until firm and crispy. Carefully remove the tacos using tongs and set aside to cool. Continue to the prepare the remaining tacos in this fashion. To make the chicken, warm the olive oil in a saute pan over medium-high heat. Generously sprinkle both sides of the chicken breasts with salt and pepper. Cook 4-5 minutes on each side, or until cooked through. (You may want to pound the chicken breasts prior to adding to the pan so they are the same thickness, this will ensure even cooking). Transfer to a plate and allow to cool. Then shred with a fork and set aside. In a large bowl, add the cabbage, radicchio, carrot, scallions, and shredded chicken. Toss to combine. Drizzle the dressing overtop and toss again. 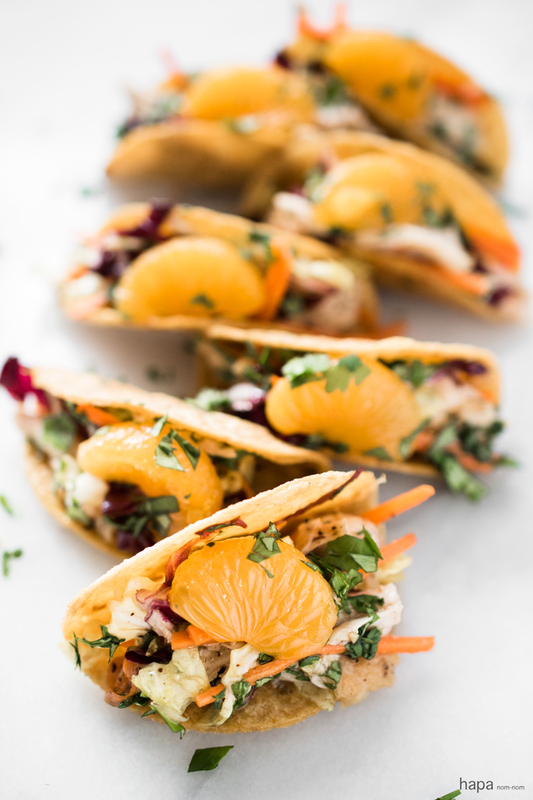 Fill each mini taco with the chicken salad, top with a slice of Mandarin orange, and sprinkle with cilantro. Plate, serve, and enjoy! These are too cute! I love the idea of baking the shells in the oven…I take the easy route and just microwave them but you may have just converted me to the oven method. Thanks, Beata. Yeah, if you want a crispy element to you tacos – baked tortillas is such an easy way to get that nice crunch! Why do we love all things mini – so much?! These are no exception! I love how they look and can imagine how they taste…I’ve never met a chicken salad I didn’t like. Thanks for sharing such wonderful insight and tips, Kathleen! Happy New Year, my friend! Thank you for your sweet words, Annie. xo! Mini tacos! I love this idea and I can scarf down one in a single bite without feeling guilty. Until I go back for 14.7 more and scarf those down too. At least they’re baked and not fried so that may save me. That oven shot is awesome and I’m totally digging the mandarin oranges! Happy New Year, Kathleen! Yes, mini and baked… that means that those extra 14.7 you scarf down will be totally fine! 😛 Hoping your New Year is off to a fabulous start, Rachelle! I’m all about the bite-size and these look awesome, Kathleen! That technique for the mini-shells is brilliant. Thanks, Marissa! Hoping your New Year is off to a wonderful start, xo! I love how you made your own taco shells in the oven! These tacos looks great! These are the cutest!!! You’re right, mini food is more fun. It’s cool that we had a similar thought to make mini tacos this week, Kathleen 😉 I adore yours with the delicious-sounding combo of orange and chicken. And they’re soooo pretty! I totally agree with small bites being more fun to eat and these are perfect. Happy New Year! Happy New Year to you too, Janette! These mini tacos look fun and delicious! They are obviously great party food, but I can have them any time, even for a midnight snack. Yum! Happy New Year, Kathleen! I’ve never had Asian-inspired tacos, but these look so good! Love that the shells are baked, not fried. Well hello fellow hapa 🙂 I’m so glad you stopped by! 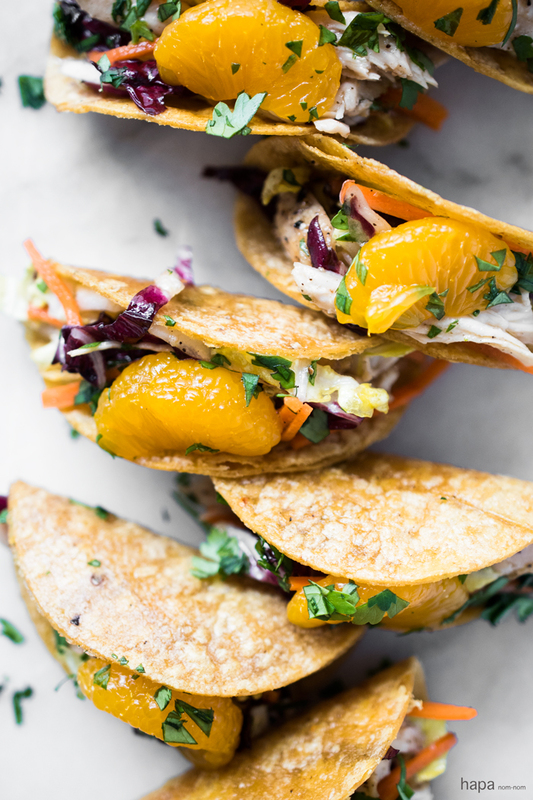 If you haven’t tried Asian-inspired tacos, then you’re in for a treat! And if you like these, you may also like Korean Tacos too! Hope you have a very happy New Year! I love bite-sized food, they’re so much fun to eat. The mini tacos look so good! These mini tacos are gorgeous, Kathleen! Love bitesize food, they would be perfect for a NYE party! 🙂 I’m excited to try the Chinese salad! Thanks, Jess! Bite-sized is just more fun 🙂 Hope you have a very happy New Year! These look fresh, colorful and delicious! Can’t wait to try this Chinese-inspired chicken salad! These are too cute to eat! If I saw these mini tacos at a party, I would grab the full tray and run out the back door 🙂 This is exactly how I made my baked taco shells at home but it’s never occurred to me that I could make them mini tacos with a cookie cutter! Love it.